A few weeks ago, on October 8, OnePlus officially confirmed that it would be holding a press event on October 30 to announce the OnePlus 6T. But yesterday, in a move that OnePlus seemingly didn’t expect, Apple began sending out invites to an event that is set to be held on the exact same date. 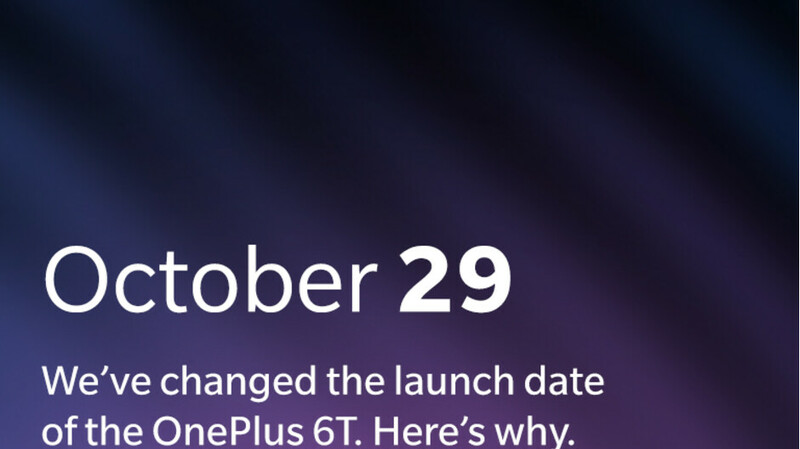 In a message posted on its official forums a short while ago, OnePlus announced that it would be bringing its OnePlus 6T event forward by one day, to October 29. The company admitted that it has spent hours speaking to press contacts across the globe in order to gain insight into how Apple’s event could affect its own announcement. Moreover, OnePlus also confirmed that it had spoken to some of its most loyal users. Ultimately, the company said that these people all provided “considered, honest and thoughtful feedback” which led them to believe its own event would be overshadowed significantly by Apple’s new products, which are expected to include an updated iPad Pro series and an Apple Pencil 2, among other things. OnePlus went on to state that, while it has built up one of the most passionate communities in the tech industry, it has to remain realistic, which is why it has chosen to change the event date. Although this was likely a tough decision for the company to make considering the number of plans that this change could disrupt, it’s ultimately the right one for the brand. After all, OnePlus can now guarantee itself a full day in the spotlight, rather than just a few hours. Nothing matters, but Apple...LOL! The problem with Android with all these announcements draws away attention from every Android manufacturer announcement and release dates. Apple is okay when it comes to product awareness and attention. As is the case with the way the current mobile world is setup and run, Apple is the responsible party for that. Up until the iPhone, most announcements use to take place either during trade shows (ex...CES, MWC etc). Apple changed that by breaking that tradition and started having their own events. Few years later everyone followed. It is ridiculous nowadays if you ask me. I think even Nintendo stopped announcing stuff at whatever the big video game conference is, and just posted “Nintendo Direct”s. And which brands actually provides all that for $500+ ? Get a brain surgery done dumbo. What is the price of the iPhone Max Xs again? You can actually buy 4 OnePlus 6 for the price of 1 iPhone Xs Max 512 GB in my Country India. The fact that what you are suggesting is android then its a big no. Even if its free. I don’t like my home to be filled with cheap products with high specs for show off. Well, if you combine those 4 phones, then maybe you’ll have something. If you want all of that, buy a Mate 20 Pro and pay the $1100+ price tag. Not as fast as the A12 and the XS series. Still lags behind in the screen department as Apple's OLED is the best in class. What a pointless comment. Nobody is comparing it to the iPhones. The guy listed everything inside a Mate 20 Pro. Last time I checked the iPhones didn't feature an in-display fingerprint scanner, expandable storage, large battery, or IR scanner. Excuse me? The in-display fingerprint scanner is still something to gamble with. Works at times, doesn't work at some. Face ID in my opinion is more secure than the fingerprint scanning, however that's my opinion. Plus, how much more storage would you need, you have multiple storage options. Plus, the Mate 20 lineup doesn't even have MicroSD for the fact, NanoSD will be expensive. Still manages to last a day without bigger batteries than it's competitors, eh? IR scanner? If you are talking about IR blasters, then almost every phone except a few of Xiaomi and Huawei/Honors include it, others don't have. Heck, even the Pixel and the Note 9 don't carry it. As for the IR camera/scanner, Apple does have it on the iPhone X and XR plus the XS series. Don't get me wrong, but announcements have now become boring. Just my opinion. What really matters is hands on, not just the 2 min "peek". The announcement rescheduling is not for the consumers, it is for the press, youtubers and other media that will do write-ups for their products. It is boring but these launchings are very important for product exposures. Am I the only one to think that was badly done by Apple. You can see when other companies have announcements and quite frankly booking the same day as someone else is foul play. And do you think that apple just plan this just by now. They’d plan it a year ago. No they didn't, they didn't know when the new iPad would be ready for release (it's actually late) so they cannot plan that far in front. Why do you think they send out the invites only a few weeks before these so called events. Are you serious? They send out invites a few weeks before in order to prepare the venue and assess their guest list. It has nothing to do with the iPad being “late”. Hell, you don’t even know if it hit a development snag or not, you’re just pulling nonsense out of thin air to back a crappy claim you made. It’s called big business dude...nothing more. I am somewhat of an audiophile when it comes to my phones. Can anyone tell me what DAC is in the One Plus 6T?